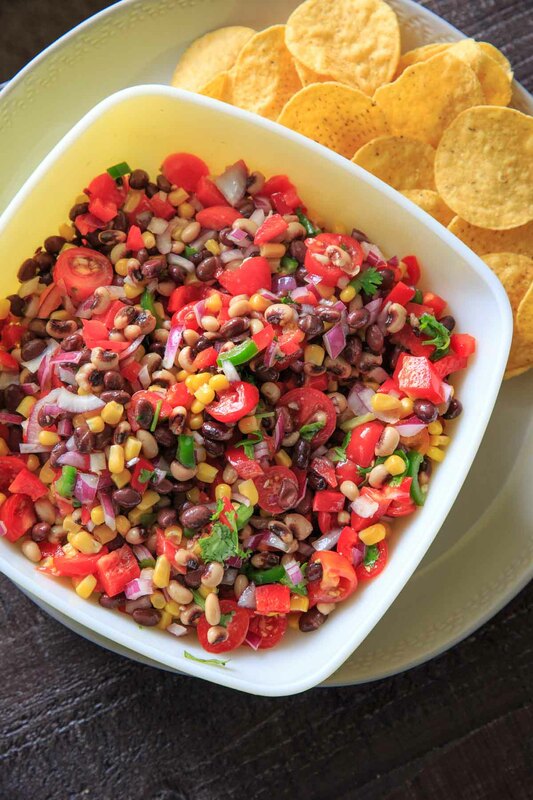 Cowboy Caviar, also known as Texas Caviar, is a simple salsa / bean salad with a complex flavor! 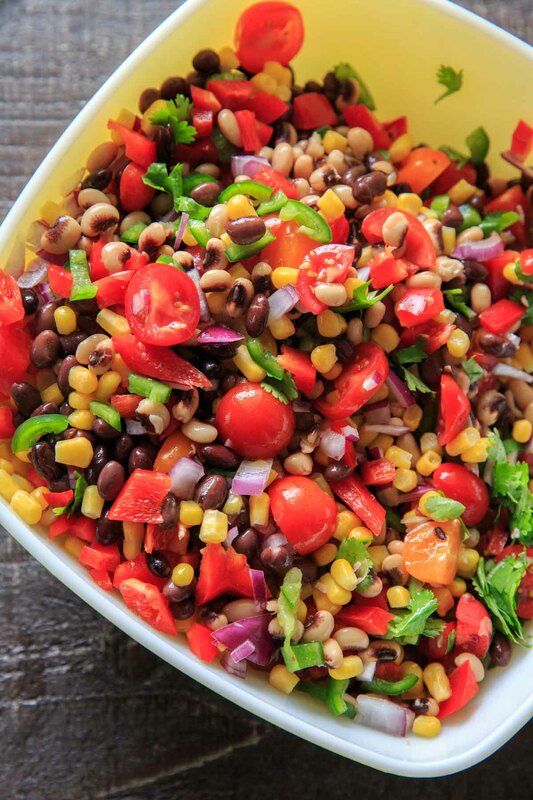 Black eyed peas, sweet corn, and other fresh vegetables covered with an herb-lime dressing that is hard to resist. Serve with tortilla chips for dipping, or you may be tempted to eat it straight out of the bowl with a spoon! These kinds of friends are my most favorite to impress with new recipes – especially when they are not only vegetarian, but turn out to be dairy-free, gluten-free, EASY and FLAVORFUL. I brought this over to the aforementioned friends house for a game night snack the other day and it was devoured. If I won them over, it’s safe to say this is a winner! 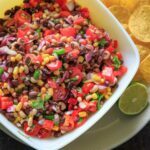 There are loads of variations of this cowboy caviar recipe on the internet. Some have hot sauce! Some have avocado! More kinds of beans! Jalapeno! Even black olives! I even saw a canned version in Trader Joe’s that looked a lot more like a tomato-based salsa, and didn’t even have black eyed peas. It was because of this trickery that I thought maybe I didn’t need black eyed peas for this recipe, and could just use double the black beans. When I actually did my research though I had to go back to the store JUST for a can of black eyed peas. It’s the first and probably only time I’ll ever spend just 51 cents at the grocery store. At least black eyed peas are supposed to be easier to digest than other beans! 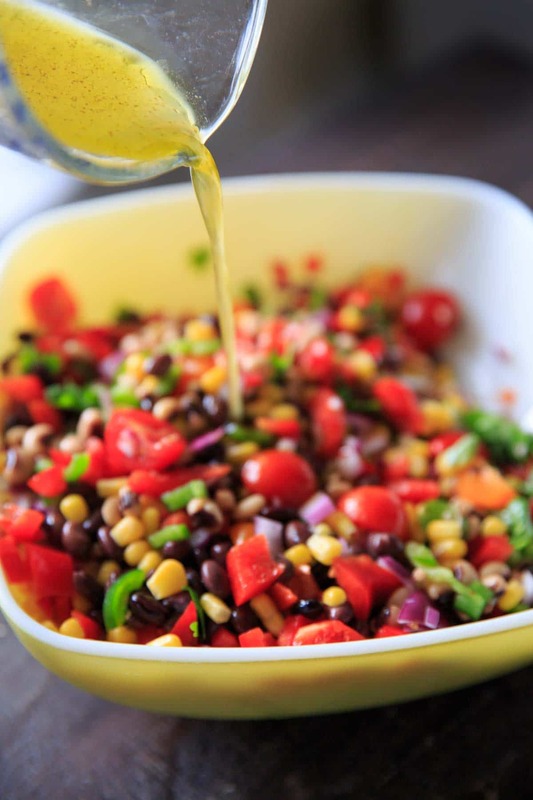 What else do you need to make cowboy caviar? Add avocados! Since avocados tend to brown over time, I do not add this right away if I’m making ahead of time. I like to add them right before serving, or to freshen up any leftovers. Change up the vinegar you use in the dressing. I like the balanced flavor that apple cider vinegar provides in dressings, but you can also use regular white vinegar or red wine vinegar, if you have it. Use Italian dressing instead of making your own. Italian dressing is very similar to the homemade option, with oil + vinegar + lemon and herbs. Add another can of beans! Add more black beans or a different variety, like pinto beans. Add more (or less) of any of the ingredients. If you really like corn, add more! If you don’t like raw onion as much but still want the crunch, use half of one! If you dump all the ingredients in the bowl and feel like you want more of something, add it. 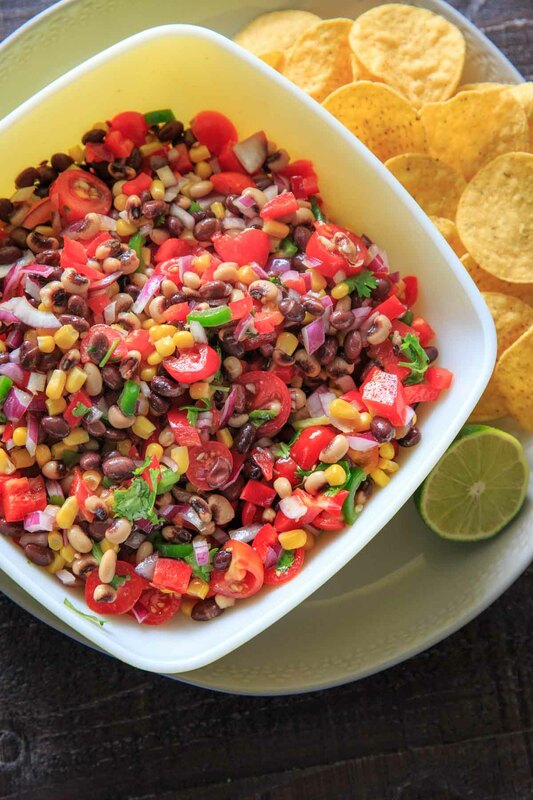 Some people call this “Cowboy Caviar” as a nickname to Texas Caviar. It got the name of “Texas caviar” because that’s where it was created – by a woman named Helen Corbitt, in 1940. She actually created the dish in an attempt to add more flavor to black eyed peas for a New Years Eve dish (they are sometimes eaten on NYE for good luck + prosperity in the new year!). Since she didn’t like black eyed peas, she added a whole bunch of goodness on top of it to cover up the taste. So if you’re wondering if you’d like this dish because of the black eyed peas, never fear! That’s why it was created. Side story: It took me forever to figure out why I had the “Let’s Get it Started” song stuck in my head and then I realized black eyed peas were on my mind for so long that I starting singing Black Eyed Peas tunes. 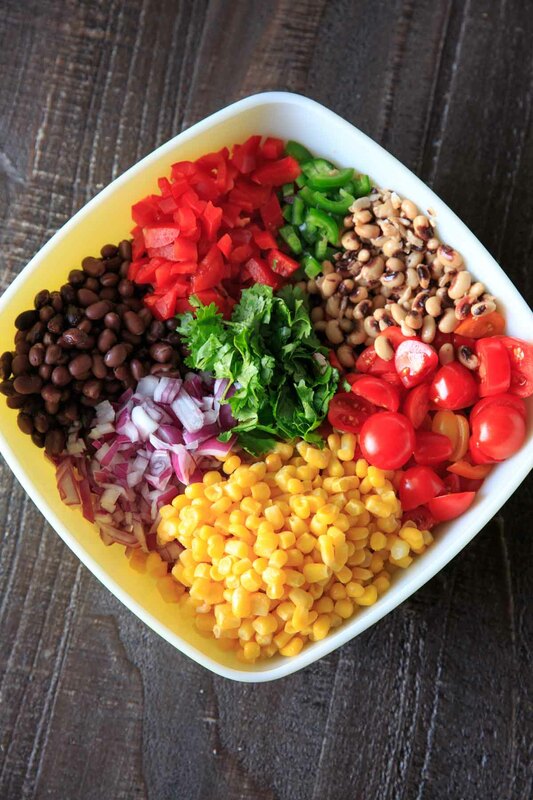 In a large bowl, add all salad ingredients (black beans, black eyed peas, corn, bell pepper, tomato, onion, cilantro, avocado and jalapeno (if using) and mix together. In a mason jar or small bowl, add all dressing ingredients (olive oil, lime juice, vinegar, cilantro, sugar, chili powder, garlic powder, cumin, salt) and shake or whisk together to combine. 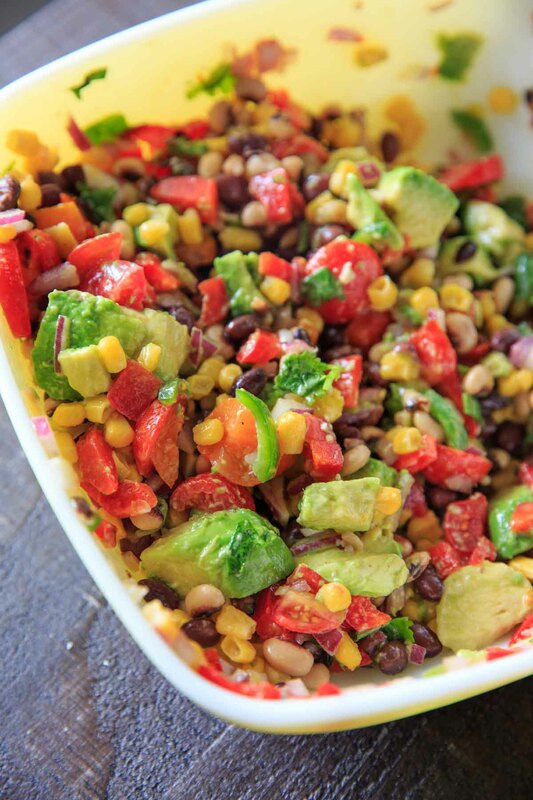 When ready to serve, pour dressing over bean mixture and serve with tortilla chips! Leftovers will keep in airtight container in fridge for 3-4 days. I wait to add the avocado until right before serving so it does not brown. You can also use red wine vinegar or even regular vinegar in the dressing in place of apple cider vinegar. 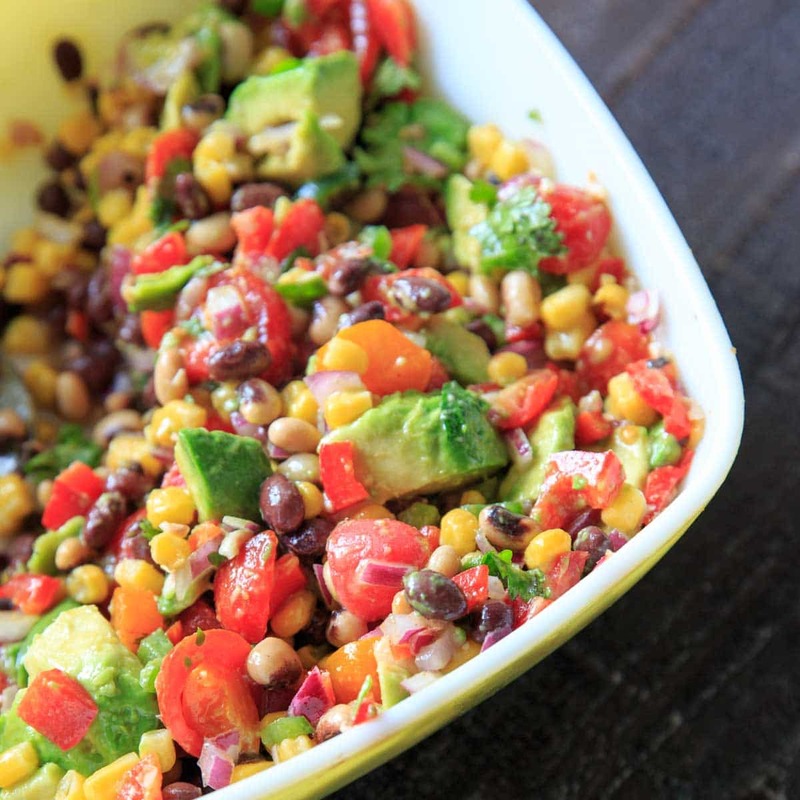 I’ve always made something similar to your recipe Kelley, but never with black eyed peas, and your dressing sounds amazing. Going to make the caviar this week. Thanks for sharing. I think this was my first time trying black eyed peas, and I really liked them with this! Let me know how you like it, Joe!